What is Depth of Field or DOF? Depth of Field or DOF is the term you use to describe what is inside the focused area of your image and what is left outside of the focused area. What does the term Shallow DOF refer to? Shallow DOF refers to a small area of focus within the image. What does the term Maximum or Deep DOF refer to? Maximum DOF refers to a great area of focus within the image. DOF is one of the most important factors in determining the look and feel of a photograph. DOF also adds depth and dimension to an image. DOF can isolate an image from its background and/or foreground. What are the three factors that control DOF? Aperture is the hole in the lens that light travels through to reach the camera’s sensor or film. Aperture is expressed in f-stops. Focal length is the distance from the lens to the film or digital sensors. The distance from camera to subject also controls the DOF. The greater this distance is the more depth of field you will have. Rule of thirds; The Rule of Thirds is a compositional technique for making interesting images. The rule of thirds states that when you place the focal point(s) of an image off-center it gives the image a sense of direction. The rule of thirds divides the canvas or photograph into three parts vertically and horizontally. The most prominent features, subjects or objects of the image, are best placed along one of the four intersecting lines in the grid. Proportion refers the size relationship of visual elements to each other and to the whole. Ratio refers to how one measurement relates to another. 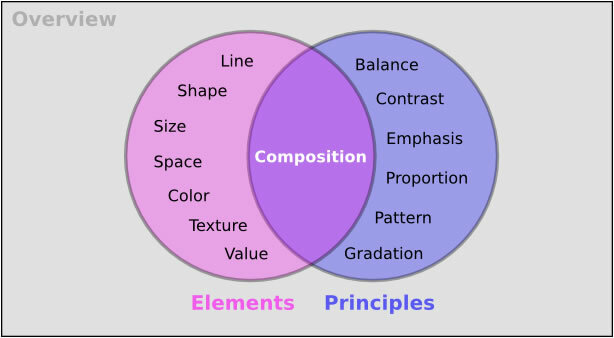 What are the Elements of Composition? The elements of art are components or parts of a work of art that can be isolated and defined. They are the fundamental building blocks used to create a work of art. A line is a linear marks made with a pen or brush; or the edge created when two shapes meet. In photography lines directs the eye – horizontal, vertical, diagonal, curvy, zig-zag, etc. A line is a form with width and length, but no depth. Line is characterized by length and direction(s). Artists use lines to create edges, the outlines of objects. Lines are also used to create perspective, and dominant directional lines are often adopted to create a sense of continuance in a composition. Line can be very simple, suggesting only abstraction, or it can suggest form even through simplicity. Shape is a self contained area defined by its form. Shapes are 2-Dimensional and flat, (circle). Forms are 3-Dimensional with height, width and depth, (sphere). Shapes are Used to create a sense of space and substance. Shapes can be created by enclosing line, or by color and value changes which define edges. Form and shape can be described as either organic or geometric. Organic forms are typically irregular in outline, and often asymmetrical. Organic forms are most often thought of as naturally occurring. Geometric forms are those which correspond to named regular shapes, such as squares, rectangles, circles, cubes, spheres, cones, and other regular forms. Architecture is usually composed of geometric forms. These forms are most often thought of as constructed or made. Space is the area used or unused in a composition. Positive space is the area the objects/subject takes up. Negative space is the area around, under, through and between. Space gives a photo a 3-dimensional feeling, (depth). Foreground refers to the front of an image, what is closest. Middle ground refers to what is in the middle of an image. Background refers to what is farthest in an image. Negative space and positive space. Space, or depth, is the eponymous property of our 3-dimensional world. It refers to the area that a shape or form occupies. Space can be defined as positive or negative. Positive space is the filled space, the object(s) or element(s) in the design. Negative space is the empty space, or the open space between design elements or objects, such as a background. Value refers to the relative lightness or darkness of an image of a color, also known as tone. Value can add drama and impact to composition. Train your eye to read color as Black and White to get a better grasp on the tone of an image. Texture is the surface quality or visual surface quality of an object in a tactile sense. Texture is captured in a two-dimensional plane by varying the pattern of light and dark areas on an object. Texture describes how an object feels, or how it looks like it feels. Textures are described by word such as rough, silky, or pebbly, smooth, bumpy, gooey, sharp, etc.. Texture adds interest, a sense of sight and sense of touch involved. The artistic term for color is HUE You need light to see color. Color saturation refers to the intensity of color, often referred to as the amount of chroma. You can use color schemes to enhance appeal or make impact. The Principles are concepts used to organize or arrange the structural elements of design. 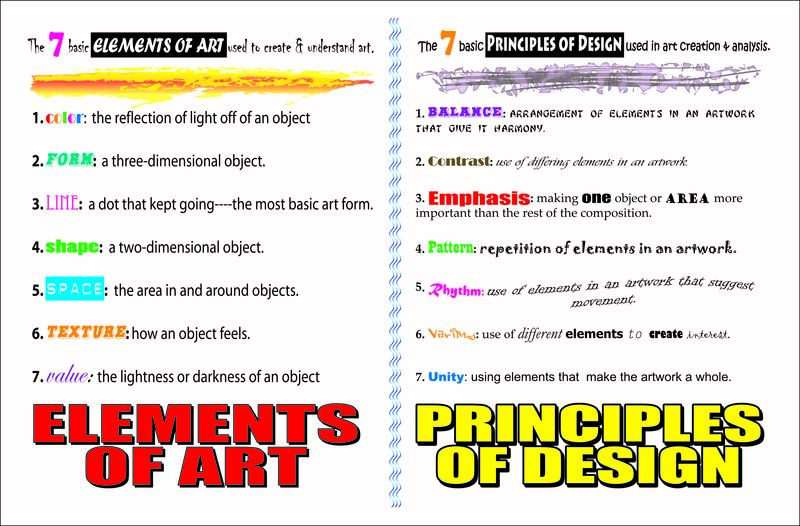 The way in which these principles are arranged (composed) affects the expressive content, or the message of the work. Link: Article on Balance within an image. Emphasis in a composition refers to developing points of interest (focal points) to pull the viewer’s eye to important parts of the body of the work. control the attention of the viewers of their design through proper emphasis of various elements. Dominance describes a situation where one element is more important or more noticeable than its surrounding elements. Equally dominant elements are coordinate. All other elements are referred to as subordinate. The focal point, a place where the action begins, or where the viewer’s eye immediately is taken. You should be able to control what will be noticed first, what is dominant in an image, and where the viewer’s attention will go from there. Balance is a sense of stability in the body of work. Balance can be created by repeating same shapes and by creating a feeling of equal weight. Balance implies that the visual elements within a design have a sense of relative weight. Visual balance works in much the same way as scales or a balance beam: when objects are of equal weight, they are in balance. Large objects generally weigh more than small objects, dark objects generally weigh more than light objects, and highly saturated objects generally weigh more than objects with less color. But several small items on one side can be balanced by a large object on the other side. Unity is a measure of how the elements of a page seem to fit together; to belong together. A unified work of art represents first a whole, then the sum of its parts. Contrast refers to the opposites and differences in the work. You can achieve variety by using different shapes, textures, colors and values in your work. Value contrast (black and white) is the strongest contrast in design. Color contrast can be effective (bright colors attract more attention than dull colors), but not as strong. Rhythm is a type of movement in drawing and painting. It is seen in repeating of shapes and colors. Alternating light and dark area in an image also give a sense of rhythm. 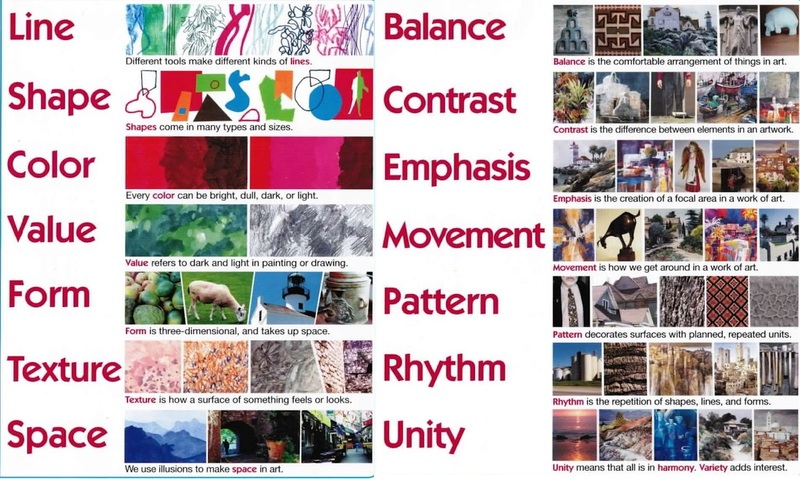 Rhythm can create a sense of movement, and can establish pattern and texture. Movement adds excitement to your work by showing action and directing the viewers eye throughout the picture plane. A pattern exists if and when an element occurs over and over again in a composition. Patterns can repeat the element in a consistent pattern and in a variation of the pattern. Experiment with lighting; use natural, artificial or a combination of the two. An image is a reproduction of the form of a person or object. A photograph is the art or process of producing images on photosensitive surfaces. What makes an image important? Images add interest to a story. They can help connect the viewer to an event, person or object. Photo composition is the art or act of combining graphic elements or persons within a frame to make one image. Resolution refers to the number of pixels or dots per inch (dpi). A higher resolution number has more dots per inch which means the display shows more detail. What does the foreground and background refer to in photography? In photography, foreground refers to the object/subject closer to the camera and/or viewer. The background refers to the object/subject furthest to the camera and/or viewer. Thanks! Now come to class and let’s complete the assignments! I think the photographer in the article wanted to show the point of view of “Hello Kitty” show about color and how the job of dressing up to be children character is easy as it seems and it can also be very unconfterable to wear. the image has a lot of dolls involved in the pictures and theres a lot of houses that look like it is in very bad condition and in the backyard theres a lot of grass or things on the walls of the house. there is a lot of straight lines and the focal point is the little girl and the walls of the house is yellowish.